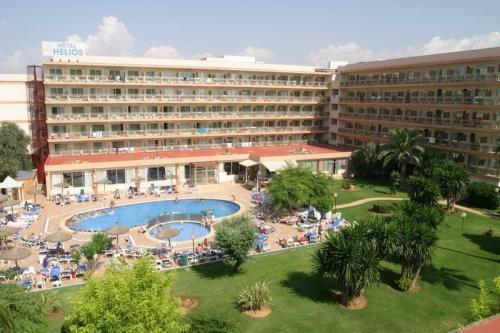 The Training Camp is based at a resort hotel in the Can Pastilla in the Playa de Palma area. The hotel specializes in packages for cyclists in the low seasons. For members wishing to be part of the group booking we have the following on offer. The hotel has convenient secure storage for the bicycles. The rooms all have private bathrooms, terrace and air conditioning. The hotel is in its own gardens complete with heated pool and only 50m from the beach. The hotel's discount offer for a club booking is for twin rooms. Our reservation will be twin rooms and the standard price is based on two sharing a room. If booking as a pair of friends then a room will be allocated, if booking as an individual then you join the rooming pool and we will match you up with another club member,as a room mate to share a room. Breakfast and dinner, which are by buffet service are in the hotel restaurant. Drinks with dinner are not included in the price and are purchased at the restaurant bar. We will have our own reserved area of tables. There is a 24 hour reception, security safes and lifts to all floors. There is Wifi and internet terminals at the hotel and a number of internet cafes locally.